Vernon and I have both been miserable with the flu the past two days. We even cancelled our big vaccination day! I’m just now starting to feel “normal” again. We don’t get hit very often with colds or flu… just because we don’t get out in public too much, I guess, so this is pretty unusual. Today, I felt good enough to start printing off my blog entries again. I’m finding that my “photographic journal” that I declare this blog to be… is mighty hard on ink and paper. Someday, my kids might treasure the fact that I’m doing this, but right now I’m considering another method! I may just have to call the local print shop and see how much they’d charge for color copies… and then calculate the cost of my ink at Amazon for comparison. On the other hand, I’m getting a chance to skim over my years of blogging and it is enjoyable. It’s fun to see my shaky literary start, the introduction of photos and video, and the pics of five years ago! I described in detail many of the ranch chores… which is why I tend to gloss over them now. I think you’ve already read it! This “Overlook”, while it may pertain to Rimrock English Shepherds, will also include those notes of a more private nature…our life on the ranch, our children, my photography, and yes, stories! 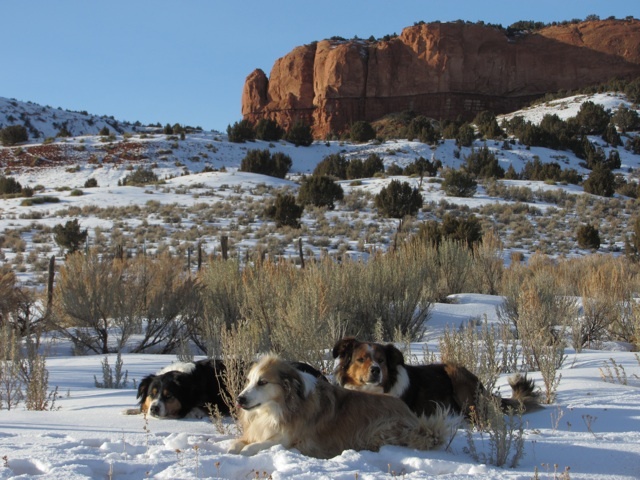 Many people have commented on our lifestyle when they reach me through the Rimrock English Shepherd website, so we shall see if this answers questions and/or provides some small amount of entertainment value as well… I hope you enjoy all that this may include. That was it. That’s how I began this journey. I meant to have a giveaway to celebrate and I’ll just do that in the coming weeks, since the past two days have been nothing to celebrate! I have a few calendars left… a mug or two… and a surprise or two up my sleeve. You’ll just have to check back to see what happens! Thank you for being here, for writing great comments, for telling your friends about Red Dirt, for buying a calendar or a piece of artwork along the way. Whether you’re a dog person or rancher, Wyoming fan or city folk, friend, relative, or quiet lurker, I hope you’ve enjoyed these past years… let’s get going on the next one!